What’s Yellow, Fast, and Female? Natalie Craudell. After moving from a Z400 to an LTR450 Natalie Craudell seemed to have the tools she needed to become a top competitor in the Women’s Expert class at Quadcross Northwest. With great end of the year performances, the 2016 season looked like it would be an great year for the young rider. But, an injury in the off season had other plans for Natalie. Still recovering, she started the season to salvage points, but her leg is almost completely healed and she’ll be working towards a full recovery in order to chase a championship. Natalie’s riding took a night and day change when she moved to the 450, and she will be one to watch in the coming years. Read moreWhat’s Yellow, Fast, and Female? Natalie Craudell. Tristan Low had a bad start to the 2016 season. He crashed in practice before round 1 and was out with a collarbone injury. Luckily for him, the specialist said he would be healed in time to take on rounds 3&4 at Albany and that’s just what he did. We caught up with Tristan just after his accident to learn more about this aspiring rider. Tyler Nelson has made a sweep through the classes since the inception of Quadcross Northwest, improving each year to jump into the next higher class. This year he takes on the ProAm bracket against some of the fastest competitors the series has seen to date. After a securing the points lead at the opening round of 2016, Tyler is looking to build on his success and stick to a game plan to ensure he can secure the top spot come the final round of year. Fighting through injuries and a other slight misfortunes, Tyler’s confidence helps to keep his program on track. We asked Tyler a few questions about the start of his season and off season to get to know him and his program a little better. If you could race in any other time, when might that be? Probably just a few years ago to have started early. What do you dislike most in others on the track? When they are over confident, and then ride unsafely due to that. What is your earliest riding memory? When I was like 3 or 4 when my brother Trae and I used to go out behind my Gramma’s house riding on our 50. I remember my first race at Horn in 2014 like it was yesterday. Super fun day! What was the happiest day of your racing career? The happiest ever was Washougal ’15 from knowing I won the Production C championship. Not getting over my fears, such as doubles. We interviewed reigning Quadcross Northwest pro Champion Ruby Davis about his racing, what he did in the off-season, and more. After breaking his elbow halfway through last season, Ruby managed to salvage enough points to retain the title and is looking to defend it this year. While the competition is stronger, Ruby’s outlook on life and racing has become more solid also. Will he be able to claim the championship again this year? Only time will tell. Rounds 1&2 of the 2016 Quadcross Northwest season are in the books! We had record entries for the opening weekend which is awesome news for the future of the sport in the Northwest and made for some awesome battles across the board all weekend. I’ve never really rode well at Horn Rapids and I came into the weekend really just hoping for a top 3 and to keep the bike in one piece. Saturday morning I got up early and headed for sign ups. After I paid my entry and membership fees I looked at the cash I had left on me and was like “Oh, I better go win some money back.” I duct taped my boots on and was ready to go. [From left to right:] Greg Bingaman from Quadcross Northwest, Ann Farina from The Code Green Campaign, & Megan Brown from Pit Traffic holding the ceremonial check. Our 2nd annual potluck was a huge success in many ways this year. 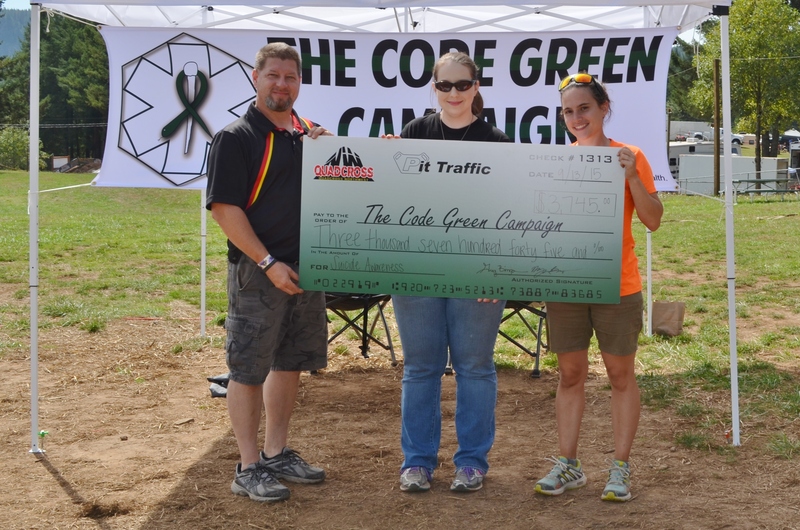 Our biggest success was that we raised almost $4000 for The Code Green Campaign, in conjunction with Quadcross Northwest. We received a plethora of donations for our silent auction and raffle, Quadcross Northwest sold green shirts, a representative from Code Green was in attendance, and caring members of the Northwest quad community (read: most all of them!) came bearing food and money to donate. 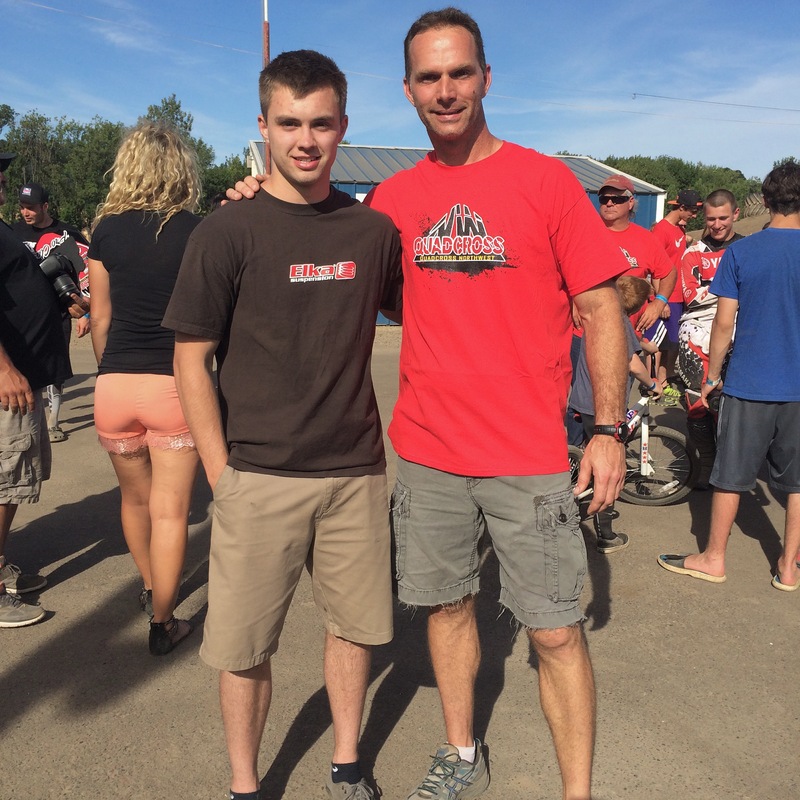 It was an amazing experience to help close out the year of Northwest racing. 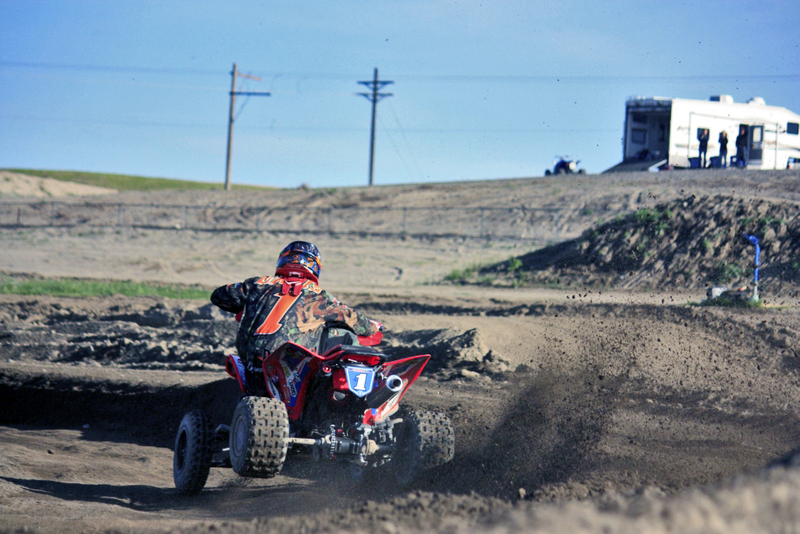 Rounds 11&12 are in the books along with the 2015 Quadcross Northwest season. This was a great season for myself, after a year off I decided to make a change and made the switch to the YFZ450R. As it turned out this was a great decision since this was my first season I’ve been able to finish since I started racing quads in 2010, so I’m calling 2015 my rookie season! The week leading up to this weekend was pretty rough, my quad had to be torn apart and the parts I needed were waiting for me at Washougal so I wasn’t going to be able to get it fixed until late Friday night. I loaded the bike up in pieces Friday morning and was just about ready to leave when I got a phone call about a family issue which held me up and I wasn’t able to leave until much later than I had planned. I ended up heading down to Washougal by myself and battled heavy traffic the whole way down. I got there after dark on Friday, tracked down the parts I needed to put the quad back together and didn’t get to bed until after midnight. Woke up Saturday morning signed up and went to the line for first practice with my alignment barely good enough to ride. It had been 3 years since I had been to Washougal and the last time I was there my quad blew up so I had almost no time under my belt on the track and it took me a while to get in the groove. Second practice went a lot better and I felt ready for moto one. 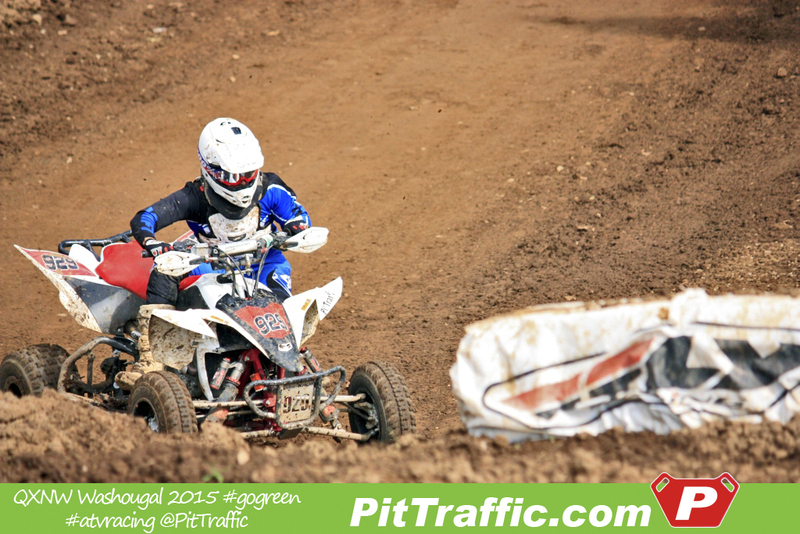 Rounds 5 and 6 of Quadcross Northwest at Albany MX are in the books and they did not disappoint! I had the trailer loaded up early in the week and we took off Friday afternoon to get some good seats to watch the Portland traffic! After a six plus hour drive on what should have been four, we pulled in and set up camp. I saw some new faces as well as some old faces that decided to dust off the boots and get back at it. Oh, and I met some guy named Joe Byrd. He is a big deal or something. Dixie Cup 2015! July 25th, 2015! Sponsorship information included! Hi Everyone! We wanted to start sharing our Dixie Cup information with you all! If you have been a regular at D and W Racing’s Rainier Flat Track for the past several years, then you are familiar with this special day! If you are new, then you are in for an entire day of excitement and flat track Racing! First, I want to share some Dixie Cup sponsorship opportunities with you all. Please read to the bottom of the email for all the information about this special event. Thank you! Read moreDixie Cup 2015! July 25th, 2015! Sponsorship information included!